RV Accounting Tips – Can you Deduct Your Phone and Data Plan from Your Taxes? Phone and data plans are essential to operating mobile businesses from our RVs. Since we use our phone and data for business, can we deduct these monthly expenses on our taxes? It depends on your situation. Let’s dig in deeper. The IRS’ standard for a business deduction requires the item or service to be an ordinary and necessary expense for business. This means if you use your phone and data to run your business, you should be able to deduct these expenses on your taxes. But, of course, there are parameters. The IRS will only allow you to deduct the portion of your phone and data plan used to operate your business. So, if you have a dedicated phone and data plan exclusively used for work, you can deduct your entire bill from your taxes. However, most of us use our phone and data plans for both business and for personal use. We take a break and check in on social media during the day and stream Netflix while listening to campground crickets at night. For those of us who use data for both work and play, calculating business deductions is way more complicated. We can only deduct the percentage of our data plan used for business purposes. How do you calculate the percentage? Track your usage. For every business deduction you claim on your taxes, you must have detailed records for proving the expenses for the deduction. So, to deduct a portion of your data plan used for business, you must be able to prove the business usage. Here are some ways of how you may be able to calculate your business deduction. Depending on your data provider, you may be able to view how much data you use each day. Take a look in your online account and see what information your provider shows for tracking your usage. You may be able to see how much data is used during business hours compared to after business hours. If you can view this information, keep a record of how much data is used for business versus personal use. Once tax season arrives, only deduct the portion of your data plan used for business. Again, depending on your provider, you may be able to track phone numbers and time spent on business phone calls versus personal calls on specific phone lines. If you can view this information, keep a record of how much phone time is used for business versus personal use. Once tax season arrives, only deduct the portion of your phone plan used for business. Tracking your usage every month is tedious. Your unique work situation may allow you to use averages to ease the tracking burden. If you have consistent work each month, track yourself for one month and apply that business percentage for each month of the year. If you have predictable busy periods and slow periods during the year, track your business usage for each period. This gives you a different business percentage to apply to your monthly data bill throughout the year. Whatever way you decide to track your usage, make sure to keep detailed records showing and explaining your calculations for your deduction claim. Kyle is a Certified Public Accountant (CPA) working from his RV full-time. He has predictable busy and slow seasons throughout the year. His busy season is four months during tax season from January to April. He works consistent hours during busy season from 8 AM to 8 PM six days a week. His slow season is May to December where he works five days a week Monday through Friday from 8 AM to 5 PM. Kyle rarely uses his cell phone to call clients. He uses Google Hangout, Skype, or Facetime to call clients using his data plan. He also uses data to email clients, work on their accounting issues, and prepare their taxes. So, Kyle is only concerned about deducting a percentage of his data plan from his taxes. With Kyle’s data plan provider, he pays $200 each month for a 20 GB package he uses for business and personal use. Kyle tracks his business usage. He sees he uses an average of 8 GB of data per slow month from May to December. For his busy four months from January to April, he uses an average of 12 GB of data per month. Kyle claims $1,120 for data used for business purposes for the year. He enters this amount on his tax forms. Where to Claim Your Deduction? Once you calculate your deduction amount, you enter the claim on your tax forms. If you are self-employed, you enter the deduction on Schedule C, Line 25 entitled Utilities. If you are an employee and you are itemizing your deductions, you enter the deduction on Schedule A, Line 21 entitled Unreimbursed Employee Expenses. You may use this rationale for calculating business deductions for other items you use for both work and personal use like hotspot purchases, computer purchases, cell phone purchases, and other expenses. However, some items may fall into another category of tax reporting called Listed Property. We will explain how to report these items in another article when we address the complicated wonders of depreciation. Remember to always keep detailed tracking records of your business versus personal usage to prove your deductions. Every full-time RVer’s situation is different and tax law can be confusing. Consult your professional CPA with your unique situation to get more clarity on what you can deduct from your taxes. Need a CPA? 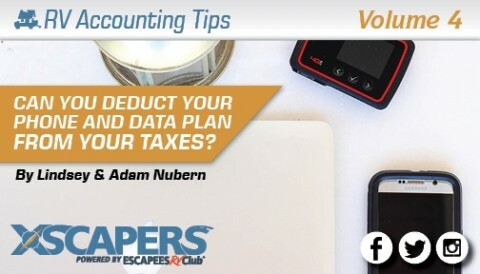 Xscapers works with CPA Adam Nubern of Nuventure CPA. Connect with Adam here. 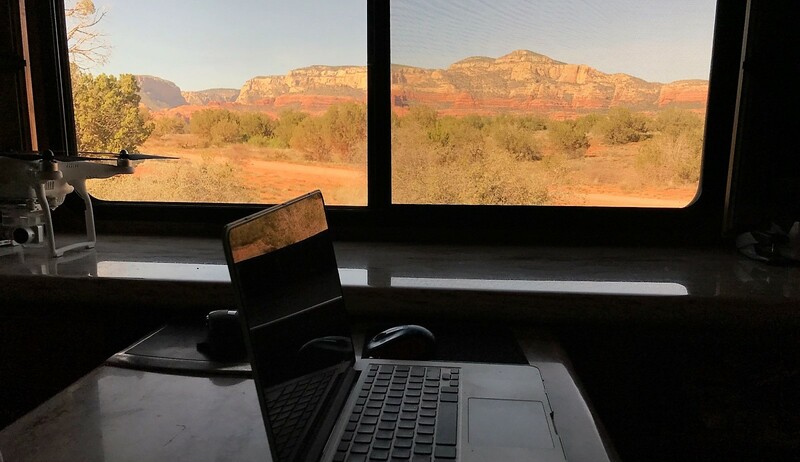 RV Accounting Tips – Can You Deduct the Office Space in Your RV on your Taxes? Should I be taxed as an LLC or an S Corporation? RV Accounting Tips – Can Advertising on my RV Save Taxes?